Use the bar code label with the patient’s name and ID to identify each specimen. For the recovery of enteric pathogens, the stool specimen must be submitted in a Stool C & S Transport Vial. Fill only to the indicated line on the vial. Do not overfill, as this may cause the vial to leak. This transport system is stable for up to 4 days at room temperature. The stool specimen must be preserved in an Ova & Parasite Kit. The Kit consists of two vials: 1 Pink Cap (10% Formalin) and 1 Gray Cap (ZN-PVA). Fill only to the indicated line on the vial. Do not overfill, as this may cause the vial to leak. This transport system is stable for up to 7 days at room temperature. 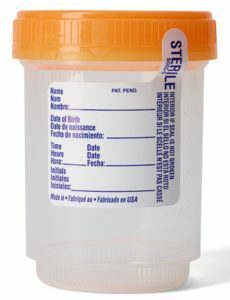 The stool specimen must be submitted in the Sterile Cup (Orange). Refrigerate at 2°-8°C. The specimen may be frozen if unable to ship the same day of collection.